The second day in our Santiago Hostel, Hostal Providencia, we noticed a sign up sheet for free terre mottos. Having taken a tour of the city the day before we had been educated as to the popularity and the strength of this drink whose name translates to ‘earthquake.’ Free drinks at a hostel, you ask? Yes, there were and yes, we signed up immediately. As we approached the patio for our free drinks that night we were welcomed by the sound of a gentle guitar and singing. While many people were seated at the picnic tables chatting, two Brazilian guys were playing the guitar and singing Brazilian songs. We had been sitting for only a minute or two with our beverages before the musicians welcomed us into the conversation. It turned out that almost the entire crowd was Brazilian! We had been drinking for only a pitcher or two until another Brazilleno arrived with a bag of traditional instruments, which he handed out with no mind to skill or comfort level. As the terre mottos sunk in, I didn’t know if I was in Santiago or São Paulo, all I cared about was refilling my cup when the next pitcher arrived and making sure that the washboard-like ‘jeca jeca’ (or something like that) I was playing was on beat to the now high decibel raucous rhythm surrounding us. It was the kind of music you would definitely want to be contributing to as opposed to listening to while trying to sleep in your hostel bed. I looked over and saw Jordan shaking a gourd draped with beads, and loving every second of it. It was a fantastic night and best of all, we met our new group of friends who we enjoyed Santiago with for the rest of the week! Mix all ingredients in a pitcher, stir to dissolve ice cream, taste, add white wine as needed. Take caution as this is quite easy to drink! 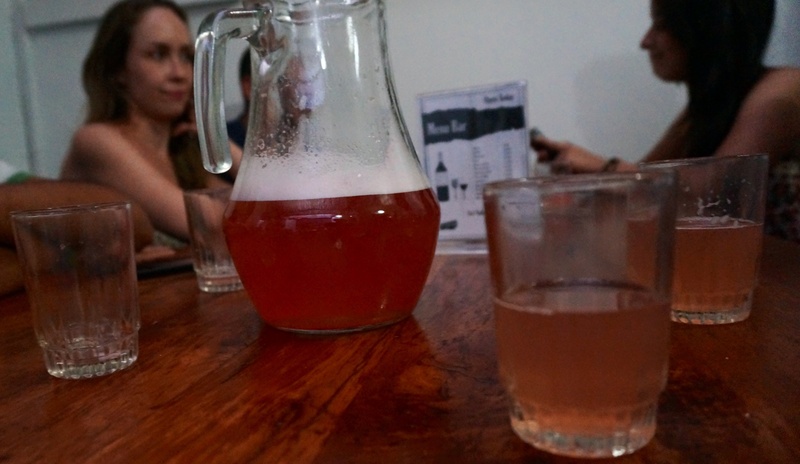 This entry was posted in Chile, recipe, Santiago and tagged adventure, backpacking, Brazilian music, Budget Travel, Chile, cocktail, drink, fernet, grenadine, ice cream, recipe, Santiago, South America, Terremotto, wine, world away, world travel by emmatrucks. Bookmark the permalink.